UMP | University of Minnesota Press Blog: Peter Smith: Have you got a case of the Central Standard Blahs, too? Chin up. Peter Smith: Have you got a case of the Central Standard Blahs, too? Chin up. 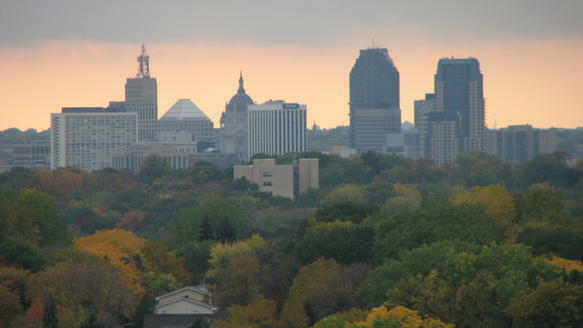 Downtown St. Paul, MN, at dusk. Photo courtesy of Wikimedia Commons. Regular MPR contributor and author of A Porch Sofa Almanac. There’s something about the first few days after we change the clocks back in the fall that gets your attention, gives you reason to pause and take inventory, and serves as a kind of spiritual tipping point. It’s all downhill from here. We’re on a bobsled ride to Blahsville in deep December, where we’ll begin the long, slow climb toward spring all over again. These first few days on Central Standard Time wear like a new pair of corduroy pants. There’s a not-broken-in-yet weight and friction to them—an oddly-familiar unfamiliarity you’re not quite sure how to feel about. Thankfully it doesn’t last long, but while it’s with us, everything feels just a little different. Our routines don’t change, but they sure as heck jostle. Everything and everyone looks a little surreal in the strange new twilight. The after-work crowd on the sidewalk—people who, only weeks ago, breezed by on their way to warm-weather activities—are still on their way somewhere. But, like those new corduroy pants, they, too, feel strange, They’re not breezing through late afternoon sunlight these days. No. They’re trudging under the streetlights like so many citizens of Moscow, trudging in heavy coats with heavier-still looks of resignation on their faces. Last week, we drove home from work in daylight. Tonight we’ll make the trip with the headlights on—with oncoming headlights stretching to the horizon in front of us, and headlights in the rear view mirror as far as the eye can see. Once home, once inside the house, we’ll sense all that uncompleted autumn yard work, (the last few leaves to be raked, the garden hoses to be coiled and put away for the winter), calling to us, nagging from out there in the dark. Saturday, we’ll promise ourselves. We’ll get to the yard work next Central Standard Time-shortened Saturday. And, softly and gently, carbohydrates are calling from the kitchen. Thick soups. Buttered breads. Mashed potatoes and brown gravy. All of it topped off with another piece of pie, all of it helping us ward off a vague sense of seasonal trepidation. The “Change-the-clock-willies” only last a day or two. Have faith. We will break in these new pants. Normalcy will return. In the meantime—are you going to finish that piece of pie? Peter Smith is author of A Porch Sofa Almanac. Click here to find information about his upcoming readings in Minnesota.